If one placed water in the batter before Shabbos, may one knead it or add more water to it on Shabbos? One did not knead the added water before Shabbos: By un-kneadable materials one may mix that liquid in it with an irregularity, doing so slowly even with a spoonAs well one may add liquid to it [although if one is adding more liquid to it then a spoon may not be used, and one thus needs to mix it with his hands]. However by kneadable materials one is to be stringent not to knead it at all. How much liquid must be added to a food before Shabbos to consider it previously kneaded? It does not suffice to add a mere few drops before Shabbos. One needs to add enough liquid so that the entire food become wet due to it, hence becoming pasty enough to be used as a dip. If water was placed in but was not enough to turn the food from a solid into a dip, it is forbidden to add liquid to it on Shabbos [unless made into a thin batter with an irregularity]. Nevertheless if a few drops sufficed to turning it into a dip, then this too would be considered already kneaded. May one add liquid on Shabbos to a mixture which was previously kneaded with only its own liquids? Example: Techina or peanut butter which was mixed before Shabbos with their oil. Ground garlic which was mixed with its own secreted liquid before Shabbos. It is forbidden to be done on Shabbos [unless made into a thin batter with an irregularity]. 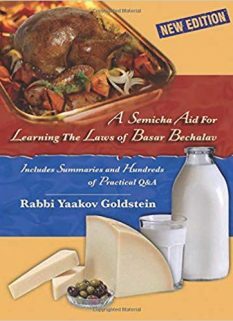 Regarding if one may knead a foods own liquid into the food on Shabbos, such as mixing the peanut butter oil into the peanut butter-See above Halacha 1 Q&A there! May one add more food into a mixture that was kneaded before Shabbos in order to thicken it? No, as by doing so one is kneading that added substance which was not previously kneaded. May one add liquid to ones dip which was kneaded with liquid before Shabbos if it is now dry? No [unless made into a thin batter with an irregularity]. May one knead an already kneaded item that has now become a solid, such as bread/crackers and the like? No. The kneading prohibition applies even to a kneaded baked item. Thus one may not add water/wine/oil to bread and then knead it with ones hands, unless done in a way permitted above [i.e. a thin batter with an irregularity]. May one dip a piece of bread in soup or a biscuit in tea/coffee? This may only be done without restriction if one places in large pieces of bread or crackers which will float above the liquid. If however one desires to mix them together, or is placing in small pieces of bread or crackers, it may only be done mixture will be kneaded into thin batter, using an irregularity. May one add liquid to a cooked dish on Shabbos if doing so will make it into a thick batter? If the food contains many small pieces which stick to each other such as cooked rice and the like, it may be done even if the food is dry. Furthermore there are opinions which permit this to be done to all cooked foods which are now soft and easily mash-able. However the Ketzos Hashulchan [130 footnote 9 and 13] brings from the Mishneh Berurah [321/62 and 64] that one may only use ones fingers to mix it. This follows the ruling of Admur regarding Charoses, brought in the previous Halacha. Apparently the reason why here Admur writes that a spoon may be used is because he is following the ruling of the Michaber at this point in the text, which allows a spoon to be used. However in the remaining part of the text, which was lost, perhaps Admur brought down the Rama which forbids its use. This would explain why there is no contradiction between the ruling of Admur here and the ruling by Charoses. Alternatively however one can explain that Admur holds that only when one is adding liquid for the first time, as is the case by Charoses, a spoon may not be used, although when simply adding more liquid on Shabbos, as is the case here, then perhaps a spoon can be used. [See Ketzos ibid in name of Iglei Tal] Practically the Mishneh Berurah [321/64] and Ketzos Hashulchan 130 footnote 13 rule the Rama’s ruling to not use a spoon applies equally by both cases. Ketzos Hashulchan 130/3 and footnote 12. M”B  in the name of the Magen Avraham  that when mixing in the original liquid that was placed before Shabbos a spoon may be used even according to the Rama. Ketzos Hashulchan 130/3 and footnote 13 in name of M”B. However the Igleiy Tal argues and allows to mix it slowly with a spoon even in such a case. it with ones hand, or by shaking the bowl. However knead able material is forbidden to initially knead on Shabbos even with an irregularity. The ruling here follows the stringency of the first opinion, as we are stringent like all opinions regarding the kneading prohibition, as states the Ketzos Hashulchan 130 in footnote 1. 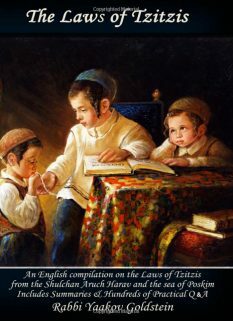 See also Ketzos Hashulchan ibid which explains based on the Igleiy Tal that in truth according to the first opinion it is allowed as kneading food which has had water placed in it from before Shabbos is only Rabbinical and may be done with an irregularity. However according to the second opinion it is forbidden because they hold that besides for there being a Biblical prohibition to just adding water there also contains a Biblical prohibition to knead liquid in. Nevertheless this does not appear to be the opinion of Admur as stated above in the actual Halacha. Either way the law remains the same whether one explains it this way or the other. So is proven from the fact Admur mentions above “with liquids………..honey……….”. Ketzos Hashulchan 130/3 and footnote 13. See explanation in previous footnote. So seems logical from the above ruling by mustard, even though mustard is not considered kneadable material, and so rules SS”K Chapter 20 Halacha 7. Ketzos Hashulchan 130/3 footnote 8 in name of Igleiy Tal. So rules also Chazon Ish 58/8-9. Vetzaruch Iyun Gadol on the SSH”K 8/7 which permits adding liquid to peanut butter on the basis that it had already been kneaded with its oil, even in a case that the oil is floating. 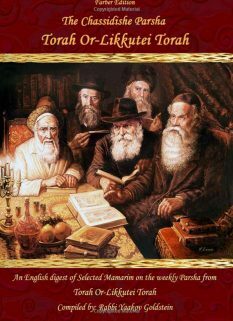 Vetzaruch Iyun Gadol. 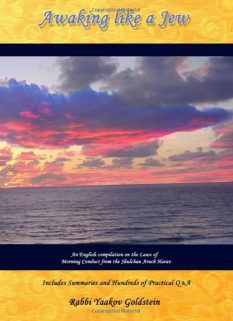 This matter follows the same dispute as mentioned above [in Halacha 1]. According to the first opinion mentioned the mixture is already considered kneaded, and thus adding liquid is allowed. As according to the first opinion the prohibition of kneading is simply to join two items into one, which is accomplished even when kneading food with its own liquid. However according to the second opinion the mixture is not considered previously kneaded unless it was kneaded with a substance other than its own. As they hold that the main aspect of kneading is the adding of ingredients, and here no ingredients were added, as the food naturally came with it. Therefore according to them in the above cases remain forbidden to add water on Shabbos to the mixture. The final ruling: As was explained above we are stringent like both opinions, and thus this may not be done [unless made into a thin batter with an irregularity]. As this is similar to dough which has been turned into bread which contains a kneading prohibition as explained. Doing so does not constitute kneading according to any opinion. As the food is already considered kneaded, as it is currently a thick mixture which sticks to each other and is ready to be eaten, and thus the adding of liquid does not change its state of food. 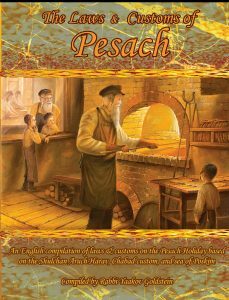 SSH”K 8/19, based on Chazon Ish Ibid which writes that the same way that cooking a food removes its grinding restrictions it similarly removes its kneading restrictions. Nevertheless the Chazon Ish limits this to case that the food is still moist. If however the food is now dry, he too agrees that it is forbidden. 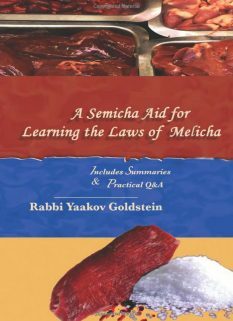 However based on the M”B in Biur Halacha “Shema Yavo” on Halacha 14, which writes that by cooked foods the kneading prohibition does not apply as adding liquid is considered the way of eating, then even if the food is now dry the prohibition would not apply. Regarding the opinion of Admur: He for certain does not hold of the M”B allowance to knead dry cooked foods, as stated regarding roasted flour which Admur rules according to the second opinion contains the kneading prohibition and thus may only be made into a thin batter. However regarding moist/soft cooked foods it is unclear what Admur would hold. From the Ketzos Hashulchan however it seems clear that he would not allow it, as he limits the allowance to add liquid to cooked dishes to cases where the particles of the food stick together and form a glob, such as in rice, and thus excludes kneading single cooked food into liquid. As they say that cooked soft foods do not contain the kneading prohibition and thus one may add liquid to them and knead the liquid into it even into a thick batter, using the regular methods.